￼Our trading partners and clients include seven out of the top ten of the world’s largest oil and energy companies and many others that are among the most influential trading corporations worldwide which value and rely upon our services and experience. The Ascon Group is an international oil and commodities trading organization that has been serving the global physical markets for more than three decades, always paying due attention to the needs of our clients. Our key focus areas are Eastern Europe, West- & Southern Africa, the Middle East as well as the Asian outlets. We are particularly concentrating on niche markets where we operate and cooperate with local companies. Ascon’s typical day to day operations entail the structuring and execution of various oil and commodity trade related transactions whilst our core business is the refined derivative product and coal trading. Since inception in 1984 we have been expanding and diversifying our business in a balanced manner, from our roots in crude oil and refined product trading in Eastern Europe and the Middle East to Asia and Africa. ASCON was founded in December 1984 as a company incorporated under the laws of the Federal Republic of Germany and registered at the Municipal Court of Hamburg. Since its inception, ASCON has been primarily engaged in the international trade of crude oil and its derivative products working with major companies in the oil industry like Caltex, Glencore, OMV, Voest Alpine, Shell, Exxon, BP, Texaco, Bayoil, Tamoil, Neste, PDVSA, Total, TPI Refinery, SAR Refinery, Sasol, SK Group, Sinosteel Corporation, Petrogulf and Batumi Refinery amongst others. Throughout our history we have traded more than 200 Million Barrels of Crude Oil and have refined a significant part of this in processing agreements with affiliated refineries. Further, we have been marketing and trading the refined distillates and related products successfully since more than 30 years. ASCON’s day to day activities therefore entail the structuring and execution of various commodity trade related transactions. 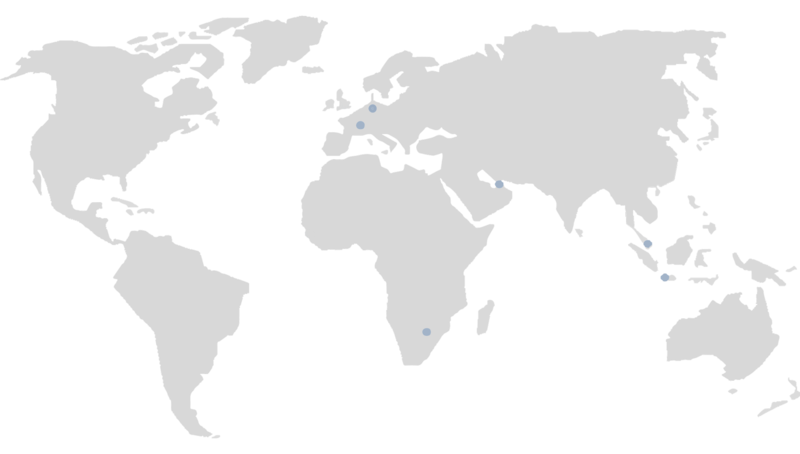 Our key focus areas are Eastern Europe, West- & Southern Africa, the Middle East as well as the Asian outlets. We are particularly concentrating on niche markets where we operate and cooperate with local companies to fill the regional supply and demand gaps and in order to open new sources for our overseas clients. PT ASCON INDONESIA INTERNASIONAL (“PTAII”) is a Jakarta based company with affiliated trading arms in Singapore (Ascon Asia Pte. Ltd.) and Hong Kong (Ascon Energy Ltd.). It is mainly focused on the energy business with a particular interest and experience in Indonesian coal trading. PTAII is operating under its own local Indonesian and export trade licenses issued by the Indonesian Investment Coordinating Board, an official Governmental entity. PTAII was founded in the end of 2015 to consolidate the already existing group coal and oil business and to serve the local markets as well as to supply to the international mining, shipping and industrial markets (including the power, steel, cement and paper industries) beyond and including SE Asia. While owning various mining assets, our company has also entered into term supply agreements with third-party coal mines to fulfil our clients’ needs. Since 2015 the trading volumes of our domestic customer base of coal have therefore sharply increased and with the access to greater supply origination and an interest in demand from beyond SE Asia, we have grown into an international coal trading group company with dedicated and experienced management. On a daily basis we have numerous coal-laden barges on the water which are shipped to our buyer’s designated discharge locations: Either local ports, export ports, stockpiles or mother-vessels, always meeting the requirements of our clients in time while ensuring the quality and quantity which we have previously agreed upon. PTAII is a young dynamic company who continues to extend the supply base to meet local and international demand for Indonesian coal and fuel products. ASCON adheres to the highest levels of integrity in fulfilling ist contractual obligations, the result of which is reflected in some of the credit arrangements that we have secured with globally recognised companies and organisations. ASCON fully complies with all financial and energy regulations under which our business operates. Our company also complies with all regulations and financial codes of ethics: market manipulation, money laundering, duties of information and code of conduct. Brahms Oil Refineries Ltd. is the result of its Founder’s vision who realized the market opportunities created by the lack of refining capacity in Africa. Combined with Africa’s strong desire to develop an industrial base and strategic reserves within each country, Brahms Oil Refineries Ltd. was thus founded to erect modular crude oil refineries in selected Sub-Saharan countries. Société de Raffinage Guinéenne S.A. or SRG S.A. has been set up as the local operational company for Brahms Oil Refineries Ltd. to build a 10,000 bpd modular crude oil refinery plant in the Republic of Guinea on the basis of a full-fledged techno-economic feasibility study. The company is registered in Guinea since December 2011 under registration number RCCM/GC-KAL/037.767A/2011. Johannesburg: ASCON ENERGY PTY. LTD.
Singapore: ASCON ASIA PTE. LTD.
Jakarta: PT ASCON INDONESIA INT.